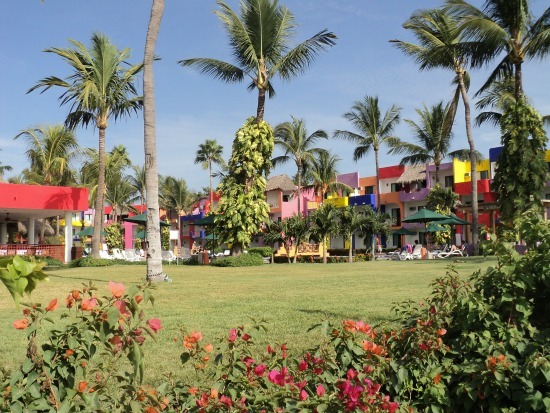 Puerto Vallarta Weather is as nearly perfect as its scenic landscape. Gorgeous tropical conditions that mimic Hawaii or Miami are what you can expect when visiting Puerto Vallarta. The peak travel season lasts from October until May. This is when sun seekers come for their annual vacations and holidays. Temperatures can get as high as 30 Celsius or 88 Fahrenheit during this time. It cools off a little at night to as low as 18 Celsius or 64 Fahrenheit. Best of all, it hardly rains during peak travel season. It's no wonder that Elizabeth Taylor fell in love with Puerto Vallarta and lived here for twenty years. From May till the end of October it gets even a little warmer. You can expect temperatures as high as 32 Celsius or 90 Fahrenheit. It will be much more humid as well. Puerto Vallarta does have a rainy season. This usually lasts from the middle of June till the end of October. The rain comes in bursts and can last about two hours. This at times can and will cause flooding in low lying areas so please keep this in mind if you are planning to visit Puerto Vallarta during this period. As far as hurricanes go, these are few and far between. In the last 10 years, there have only been two hurricanes. Puerto Vallarta Weather, is there anything not to like about it? Yes, they do have a short rainy season but heck, who doesn't enjoy a little rain every now and then. And yes, there are occasional cloudy days too but all in all, this is a sun seekers paradise. Maybe that is why everybody is so happy when they are here. © 2012-2013 All Rights Reserved.